Here is a great opportunity to involve your high school students in a fun competition where they can learn finance and earn REAL money. When tested on general financial knowledge, nearly 50% of high school seniors fail. H&R Block working on changing that and is committed to helping teens learn how to manage finances. The H&R Block Budget Challenge is a simulation and interactive competition for high school students. Teens act as recent college graduates who've started their first job. They receive regular paychecks and have to make decisions about cell phone plans, where to live, credit card offers, etc. They must pay their bills on time and earn points for making smart financial decisions. 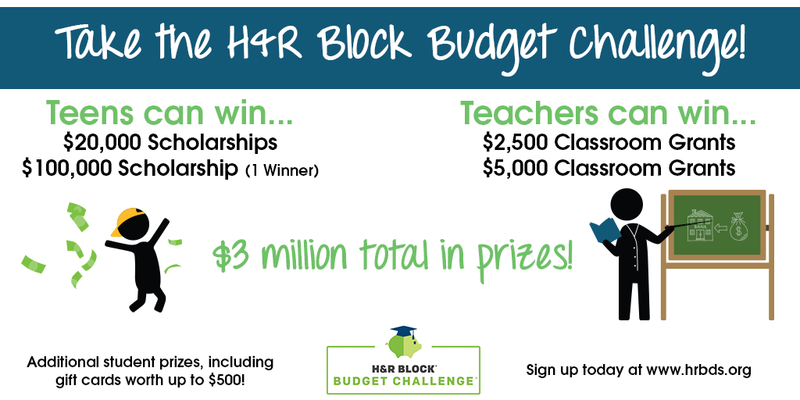 The H&R Block Budget Challenge is free to play and H&R Block is offering both classroom grants and student scholarships to the winning students. When teachers sign up they will receive a free print kit to get them started, including a classroom poster and lesson plans. They have also developed videos that teachers can use to teach some of the financial concepts. This is a great opportunity to dip your toes into a "Flipped Classroom" concept. Kids can play "Would You Rather?" with Justin Long Play the Would You Rather game by texting START to 38383. You'll answer outrageous questions and learn real tips to stack your cash. Then challenge your friends to play and see their answers. I'd love to hear what you think about this challenge. Please let me know if you participate. I look forward to your comments. I think that the H&R Block Budget Challenge is great for many reasons. This challenge will educate teens to be more responsible with their money. Teens often do not value money when it is just given to them or at least I didn't when I was a teen. When my mom would give me money I would spend it on silly things, but when it was my money that I earned by working, it was a different story. When I would spend the money I earned I would asked myself "Do I really need this?" the whole time before checking out. With the budget challenge it will help prepare for the future by, being independant, more conservative with money, and teaching the value of money. Great Blog and Thank you for sharing. My name is Edna Montgomery, I am a student in EDM310 at the University of South Alabama, in Mobile, Alabama. This is great, getting our schools involved in teaching our children about money and how it should be spent. H & R Block should be given a special recognition for this much need to know topic. Teaching students knowledge about money before entering the world of handling money, is a giant step, in the right direction of being financially healthy. Here is a link to my class blog, and my blog. I will post a summary of your blog on my blog October 12, 2014. My name is Tori Hudson and I am a student at the University of Alabama in EDM310. This is such a great idea to give high school students a taste of what it is like in the real world! I know when I was in high school, the whole money thing did not click with me until I got my first job with very sad paychecks and I had to find a way to make it work. Many of my friends however did not get that reality check until much later and it would've been awesome to have a challenge like this in my high school! Thanks for sharing!